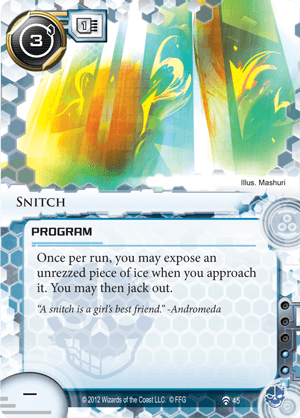 It's interesting, really, that this card is so often ignored, especially with (written during Breaker Bay) the prevalence of Replicating Perfection on the world scene. Expose is an often underrated mechanic - this of course makes face-checking ICE far safer, and makes things like Self-modifying Code and Clone Chip a bit more interesting during the run. Expose, though, isn't the real reason to use this card. In the normal turn order, you can't jack out on the first piece of ICE in a server. This card allows you to do just that, to spend a click to see what's there and then leave before it has an opportunity to affect you. Against RP decks, this doesn't save the click for the required run, but does save the cash necessary to interact with that first piece of ICE on the central server you've chosen to attack before turning your attention to more choice targets. It turbocharges Au Revoir, allowing a runner with a surefit of MU to pull up to three credits for bothering to look at a piece of ICE, making it an interesting potential economic engine. Most importantly, though, it introduces options - letting you make decisions with fewer corp secrets. Its affect on the game is subtle, and, when used well, can offer interesting synergies, especially in decks where Self-modifying Code is a high influence cost.